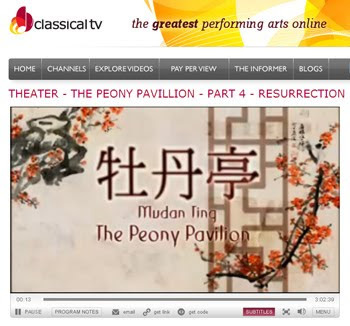 Classical TV offers videos of the best classical performances from around the world. The site hosts an exclusive library of full-length videos of current and recent performing arts events, all available for streaming on your home computer. In addition, Classical TV offers a wealth of lively, informative, feature articles, topical playlists, insider columns, and cultural news. Classical TV's core library contains more than 1100 hours of exclusive performances of opera, ballet, concerts, jazz, drama, musicals, and documentaries - many from the world's most prestigious cultural venues, including New York's Metropolitan Opera House, London's Royal Opera House, the Paris Opera, Milan's La Scala, Moscow's Bolshoi Theater, St. Petersburg's Mariinsky (Kirov) Theater, and many others. While some of the newest performances are pay-per-view, the site provides access to over 200 videos for FREE!